I attended the Witney Steam and Vintage Fair the other day, and as you can probably surmise by the name, it was full of people showing off their steam engines and vintage cars. I do like a bit of steam engine action, so I was looking forward to catching those snarling helions as they rumbled and clanked around the arena, to the glorious sound of raw 18th century fury. Unfortunately most of the engines were just that - engines, propped up on platforms and going about their business of endlessly pumping water into and out of an accompanying tank, or chugging away to illuminate a few light bulbs. Not quite the rampant industrial savagery I was expecting. There were of course a few of the mighty beasts in attendance, as the picture above demonstrates, and a fine congregation they were. But it wasn't long before I had exhausted their appeal, so instead I turned my attention, and camera, to the classic cars, of which there were an abundance. The weather was a bit overcast, but still quite bright, which would have meant very bland boring skies, so to eliminate this, I made use of the beautiful details these automobiles readily flaunt. Before I get on to the cars, here's a picture of some mighty cogs from one of those imposing steam engines. They certainly do not build them like that anymore. bit of a monster. The car that is, not the fin, that would be going too far even for the 50's. definitely a pickup of some kind. The creamy blue of the paintwork was quite spectacular. pamphlet, single sided and most likely written in comic sans, I won't claim to any definitive statement of fact. that luxuriant version of the iconic Zephyr. 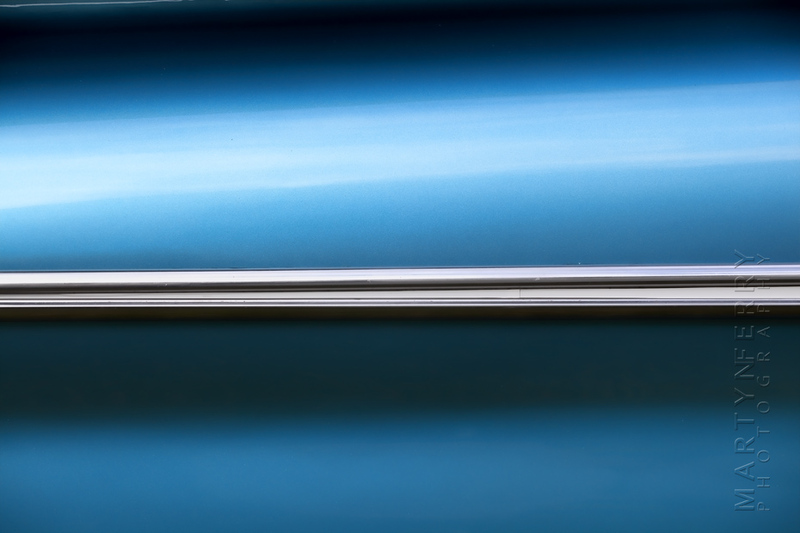 The two tone paintwork from, well, a car, an old car in fact. I can be no more descriptive than that. processing, and must of accidentally pressed a button labelled 'mental'. But I like it, so here it is. Something a bit more grrrr, this is the front badge from a Mammoth Major, a beast of a truck. civilian versions of the 'Mat' appeared later. Front badge from a Vulcan bus. Detailing on the bonnet, or hood as they are called in its home country. Yes I speak many languages. A door panel looking better than any car has a right to. here's a few from an old army truck that was knocking about. So all in all, it was a very enjoyable way to spend an afternoon, camera in one hand, fascinating facts about engines in the other, and the smell of burning fuel filling the nostrils with a heady aroma of days long past.